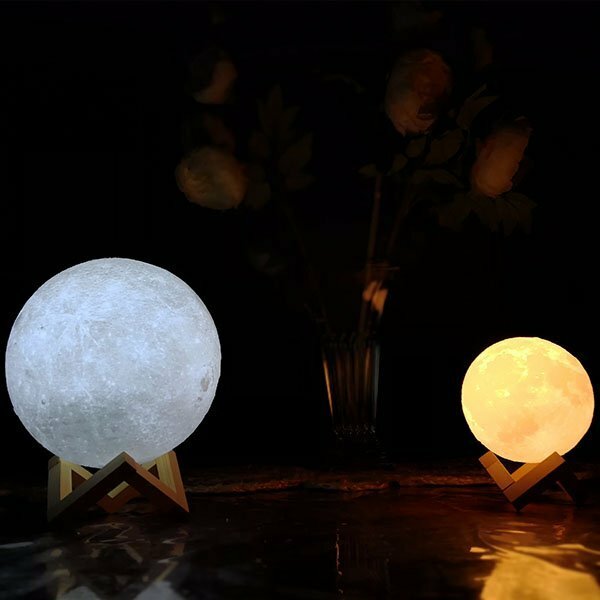 With 4 sizes to choose from, and with each moon lamp having 2 colour variations, we have created the safest and most beautiful moon lamps in Australia. We hope our moon lamps bring you joy, ambience and beauty just like they do for our many customers. Our Moon Lamps use the most cutting edge 3D printing technology to print layer by layer and create the most beautiful and realistic appearance of the moon. Our moon lamp releases enchanting ambient light with both options of warm and cool white light. It is a great centrepiece and the talking point for your home, business, office or even for the kids as a night light in their bedrooms. Our lights are safe to hold in your hand and look great inside their wooden display holder. They look much more expensive and elegant than they show in our photos. It will truly be a focal point of any room. I love astronomy and this little moon is incredibly similar to the real deal. Good quality and am enjoying it very much. 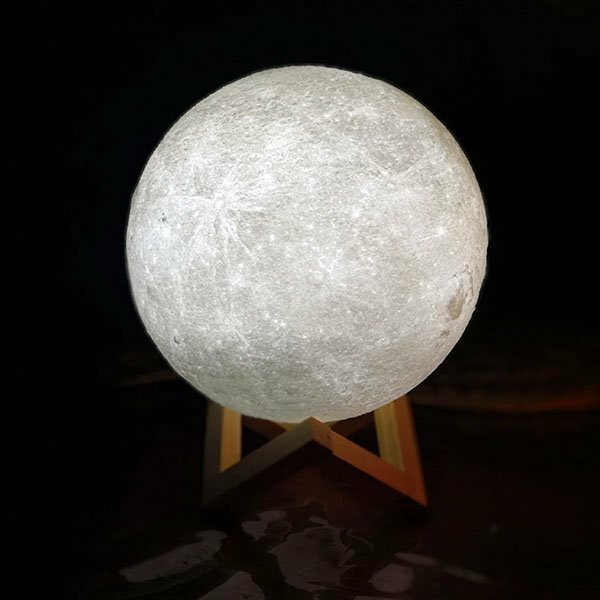 SUPER REALISTIC MOON SURFACE: Our moon lamp looks much better than the 3D printed Moon Lamp, because it is empowered by precision 3D technology, and exquisitely crafted according to NASA satellite images of the moon. The surface is vivid with a realistic touching of the detailed crater and mountains. PLA Material Extracted from Corn Stalks, The Lamp is Odourless and Non-toxic. EASY OPERATIONS: It is an interesting experience to operate the moon lamp just by a tap, no button. The funniest thing is that the lamp will change colours every time by gently tapping, your kids will love it. BRILLIANT GIFT: it is the perfect gift to friends in Christmas or birthday! Pretty to decorate your room by holding on a natural wood bracket, no space occupation, just creating a warm and romantic space for you. It is a fantastic gift for all holiday. Not ALL moon lamps are created equal. 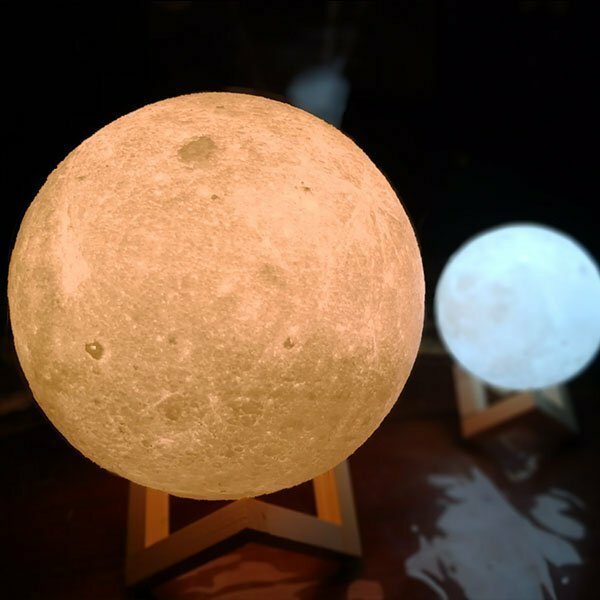 Our moon lamp looks much better than the 3D printed Moon Lamp, because we have designed it using precision 3D technology, and exquisitely crafted according to NASA satellite images of the moon. The surface is vivid with a realistic touching of the detailed crater and mountains. PLA Material Extracted from Corn Stalks, The Lamp is Odourless and Non-toxic. We are the preferred Australian supplier for moon lamps in Australia. We have moon lamps in Perth, Sydney, Melbourne, Brisbane, Adelaide, Canberra and can deliver to most regional centres. 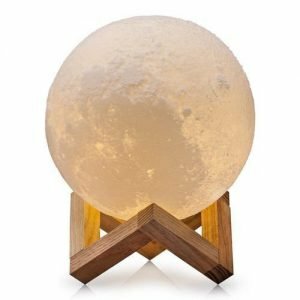 Moon Lamps range in price starting around $49.95 right up to $79.95. We also offer Free shipping on all our products with no minimum order amount. Do not get stung buying a cheaper moon lamp as the quality will be no good. Also, some people prefer Moon Lamps from $34.95 but then get overcharged for shipping. With us it’s the best price every day and we include the shipping. RECHARGABLE—Recharge your moon night light with the provided USB charging cable. Connects to any micro-usb adapter (not included). 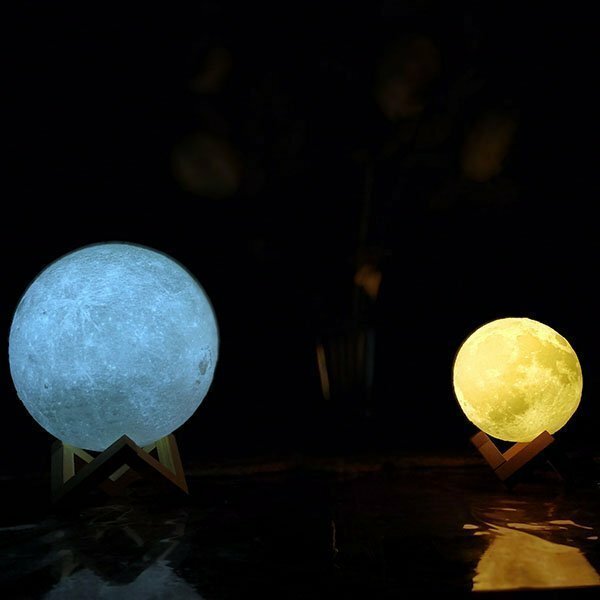 Add magic to every room at night with our elegant and beautiful moon lamps. Whether reading a book or relaxing, our moon lamps provide the perfect ambient light. while you’re reading your books or admiring the beauty of the moon before bed. Our moon lamp comes in an original box and once opened it is the perfect unique gift or present or for you to cherish. Our moon lamps are truly out of this world. Beware of cheap knock offs selling fragile designs with non-compliant rechargeable batteries (very dangerous for your home!) Also know of cheap eBay knock offs and replicas. Ours are the premium moon lamps in Australia.